Late 19th century French floor cushion made from an interesting and unusual striped linen/cotton ticking with an indigo ikat detail.Stripes of faded beige, red and yellow with the indigo ikat floating in between.Backed in a vintage denim cloth with a zip closure. Filled with a duck feather cushion pad. 19th century French woven cotton flamme/ikat panel, an unusual variation that is woven with a brown yarn. A lightweight cloth that is in a good unused condition. 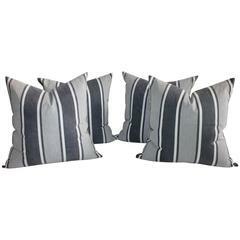 These tan and red striped ticking pillows are in fine condition. The backings are in a cream cotton linen. Four pairs in stock 20 x 20 / 22 x 22. 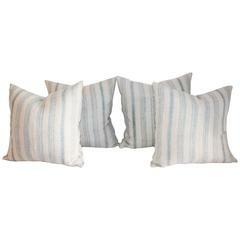 This pair of wide and narrow blue and white striped pillows are in good condition. The backings are in light blue cotton linen. Sold as pairs. Two pairs in stock. 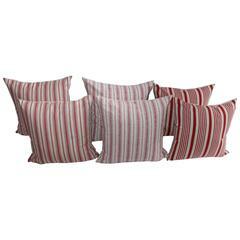 These red and white stripe ticking pillows are in fine condition. They come in sizes 20 x 20 and in 22 x 22. Four pairs in stock.